Wondering if it's possible to print JSON like Node.js prints it out. If there is some standard module or something to do that. It has the spacing between keys, and when it's too long it goes onto a new line, etc. The coloring would be a bonus. 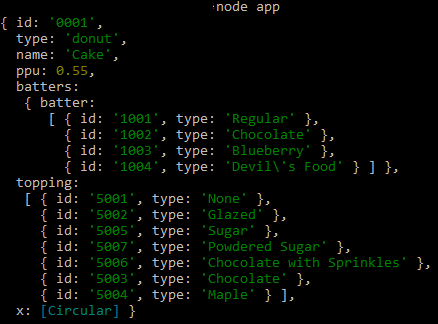 pretty prints the JSON, wondering if there is something more hidden in there, or any standards, for doing it like Node.js does. Thank you. To make it recurse indefinitely pass depth: null. The default value seems to be 2 in the node cli as well.